I was initially interested in working on an embedded MOD player approximately 3 years ago. I was working with AVR devices, mainly because I had access to them. I quickly ran up against the resource limitations of those devices. Fast forward to now when I have access to STM32F4 devices with 128kB of RAM and anywhere between 256kB and 1MB of flash memory. I should note that this experiment began on an STM32F401 which has 96kB of RAM. 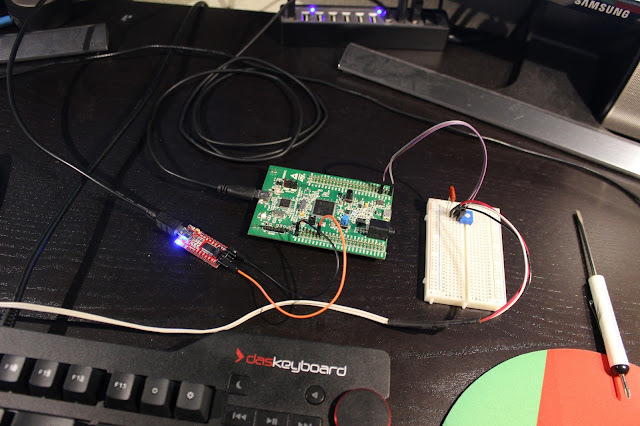 I was able to load and play small MODs and XMs on a Nucleo board. I moved up to the STM32F407 in order to play much larger and more interesting files. The first step was to compile libmikmod for Cortex-M4 using an arm-none-eabi toolchain. I looked at other examples in the libmikmod source tree for support on unusual platforms such as the Sony Playstation Portable or a Korean Gameboy known as GP32. # libmikmod Makefile for targetting Cortex-M4. This Makefile is inspired by the GP32 and PSP drivers. They gave me insights into the minimum necessary to build libmikmod and then I took it a few steps further. I also removed all of the other drivers except for drv_nos which is required as a fallback when no other driver is available. After some experimentation I was able to produce an archive file to link into my application. To my surprise the library worked on the first attempt. I decided to use ChibiOS for this project. It comes with a kernel that supports pre-emptive multitasking and a hardware abstraction layer (HAL) with drivers for all of the common peripherals: UART, SPI, I2C, PWM, GPT and more. Here is the main function for my program. As you can see, it is not terribly complex. Initializing MikMod is very straightforward. I included some logging to make debugging easier. I register an error handler with MikMod and print the logs to a serial console. This is handy when attempting to play a MOD file that just barely fits in RAM. MikMod will happily invoke this function and tell you that it failed to allocate memory. * Initialize the serial console for logging. * Initialize and configure libmikmod. I contemplated using the CS43L22 audio codec in the early stages but decided it was not worth the effort. The STM32F4DISCOVERY includes this codec with a convenient 3.5mm jack for connection to headphones. I decided not to use the codec due to the effort required to initialize and enable streaming audio output. There are several samples available online, but if I want to work with an audio codec I would prefer to take a deep dive and read the entire datasheet. I decided to use a PWM output to generate an audio waveform and am very satisfied with the results. A PWM peripheral is configured to run at a very high frequency and a general purpose timer is used to update the duty cycle at a rate of 44.1kHz. These two devices working together produce an audio waveform. This audio driver is double buffered. When playback begins, the first buffer is filled with audio samples and the PWM/timer are enabled. While the first buffer is playing, the second is filled with sample data. The driver then waits until playback from the second buffer has began to replace the contents of the first buffer with new audio data. This ensures that the audio output is never starved for data (buffer underrun). This is based on the assumption that generation of samples is much faster than playback. // Initialize the PWM peripheral. // Initialize the GPT peripheral. The remainder of the driver is straight forward. I implemented the required callbacks from the MikMod library to control the state of the PWM and timer peripherals. I then spent time tuning the audio output. I initially had misconfigured the period of the PWM peripheral and introduced significant aliasing into the output. I may look at libmikmod some more. Some optimizations that I made included marking constant lookup tables as const to move them from RAM to flash. This made improvements in the output of arm-none-eabi-size. This change would likely benefit all platforms so I may consider upstreaming it. I would also like to look at making some dynamically allocated buffers static. Their size is known at compile time and allocating them statically would reduce heap usage and subsequent fragmentation. This is a major concern on embedded platforms. Would it be possible to have just a single ring-buffer for output to save some bytes ? Most likely, yes. The advantage of double buffering is that MikMod can generate a few bytes at a time. You can think of the two buffers as entries in a ring buffer with a length of 2. Hi, can you share complete code?